I wrote about Raw Spice Bar some time ago. It's a neat idea - it's a subscription service where you get different spice blends on a regular basis. When I last wrote about them, the amounts were pretty small. Like, you could make one recipe, perhaps, but then you couldn't make it a second time if the recipe needed a lot of spice. You could, of course, order more. But once you'd tossed the packaging, would you really remember the name of the mix? Or remember to order it? Now, the packets are larger, holding just about an ounce of spice mix each which is a decent amount, but not so much that you'll have it hanging around until it's lost all its flavor. The subscription is quarterly, so you get plenty of time to use the spices you get and think about which ones you're going to re-order. The packages are also nicer, which I appreciate. They reseal easily, and if you want to stand them up, the bottoms can be spread out so the packet stands on it's one. 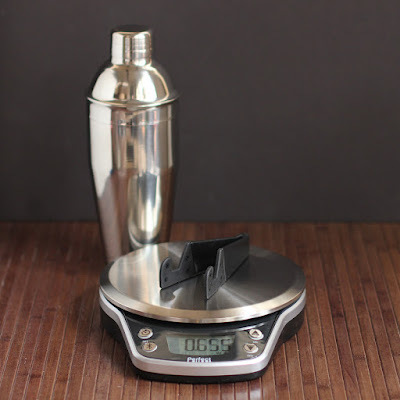 That's great if you want them open to measure and you don't want then laying flat on the counter where they can spill. The quality of the mixes is still really good, and great for creative meal planning. And ... you don't actually need to order a subscription, if you don't want surprise spices coming to your door. You can order mixes, individual spices, spice sets ... oh heck, don't make me tell you about it. Just go to the Raw Spice Bar website and browse around for a while. You'll see. I received spices at no cost to me. Lemme get this out here. 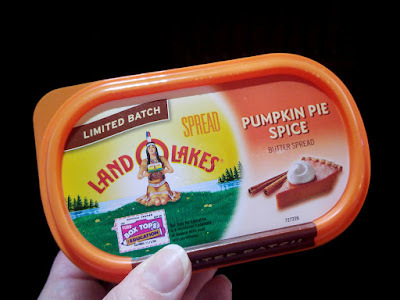 The nice folks at Land O'Lakes have been sending me samples of stuff lately. I mean, it's butter. How can I say no? I'm not obligated to post about this stuff, but I thought the time was right to talk about it. Quite some time ago (prior to this recent samplefest), I actually reviewed their soft butter with olive oil, and I've been buying it ever since. I don't use it for cooking, but I love it for toast or English muffins, or any time I don't want to fight with refrigerator-cold butter. Yes, I know I can keep my butter on the counter, but I haven't been doing that lately. So, yeah, I'm addicted to the butter with olive oil. Then they sent me a new low-salt version as part of this new send-some-samples thing. Hmmmm. When I tried it on its own, it didn't seem bland, the way low-salt things can be. When I tried it side-by-side with the regular version, I could tell that there was a difference in the salt level. I'm going to just say that it's going to be personal taste whether you like the less-salt or more-salt version. At the moment, I'm sticking with the one with olive oil rather than a canola version and salt will be my second consideration. So ... it depends on what's at the store. Then ... they sent me a pumpkin spice butter. Obviously a seasonal product. All I've got to say is that if you like pumpkin spice, run out and buy this NOW. I've been eating it on English muffins. It would also be awesome on toasted pound cake. Mmmm. Warm toasted pound cake. Excuse me while I put pound cake on my shopping list. I'm on a list, so I'm getting free samples from Land O'Lakes on occasion. No obligations, so you'll only hear about them when I think they're worth a discussion. Another month, another box of treats and savories from Degustabox. They send me one of these boxes every month so I can tell you all about it, so you get an idea of what you might get if you subscribe. November's box is one that I dug into almost as soon as it arrived because there were so many things I wanted to eat. And a few that I wanted for recipes. I slapped my fingers and waited until I took a picture of the goodies, but there were jars opened and bags ripped pretty darned quickly. I've gotten these before, and they're very nice caramels. There are several different flavors, so you can choose your favorite. I love caramels. Yum. These are a classic shortbread, and they've showed up in these boxes before. This time, though, the shortbreads were in the shape of Scottie dogs, so they were a little more fun than the more classic shapes. How cute, and a nice little cake for people who don't want a ginormous panettone hanging around. I'm not a huge fan of this classic cake, so I passed it along to someone who enjoyed it much more than I would have. Just one gram of sugar and five calories per bottle, this is a good tea-to-go-with-no-fuss. I haven't tried it yet - weather has turned chilly, so I've been drinking a lot of hot tea. But it's in my fridge for a day when I want something more flavorful than my usual water that I drink during the day. I've bought a lot of Goya products over the years, but I never knew they made tortillas. It just happened that I had some leftover steak that wanted to turn into tacos, so I ripped open this bag right away. They're nice tortillas right out of the bag and even better when they're lightly toasted. Turkey jerky arrived. Hmmm. I don't dislike jerky, but it's not really my thing. Which is odd because I love cured sausages. I didn't want to sample a tiny bit and hand someone an open bag, so I passed the whole thing along to a friend. If you're a jerky fan, this is made from cage-free turkey breast with no added hormones. People received either the jerky (above) or this broth. While I like making my own broth when I have time and bones, I've been using more boxed broths. They're handy to keep in the pantry, and they save time when I'm cooking, since they don't need to be thawed. I'm looking forward to trying this one. I've got risotto coming soon. Remember those tacos? Yeah, I needed salsa, too, so this got opened. This is a chunky salsa with a thin sauce. Great on my tacos, but I can also imagine it spooned over chicken breast to give it a reason to be on the plate. This was flavorful with a little heat, but not painfully hot. Good stuff. I was sooooo curious about this. I was slightly worried that it would be overly sweet, but it really wasn't. Inside the bar is Oreo bits and Oreo filling, and it's coated in Milka chocolate, which is a European brand. I've heard that there's a mint version as well. I'm going to look for that, because I adore mint and chocolate. This instant coffee includes coffee, sweetener, and nondairy creamer, so it's pretty much emergency coffee for that day when I've run out of coffee and the milk needs to be used for a recipe. Or for when I want to take coffee on the go. This would be great to keep in a desk drawer or in the car, too. Apparently this brand got its start in 1867, but I don't remember that far back. Obviously. I think I've seen this in stores, but didn't really pay attention. It's a mix of herbs and spices, but no salt, and according the the company, it's "a staple of Thanksgiving tables throughout the country." After I read the ingredients, I decided it would be good on pork, too. Experiment will ensue very very soon. This little freebie is just about enough for one serving, so I'm hanging onto it for that time when I've got leftover chicken and I want a barbecue chicken sandwich. Gotta love that single serving. Degustabox sends me a box every month at no cost to me. I've owned quite a few mandolines over the years. Some I bought; some were sent to me for review. This mandoline finally does the one thing that previous mandolines didn't. Yes, it cuts thick and thin straight and waffle slices. Yes, it just small and large square (julienne or fry) cuts. Lots of mandolines do that. Yes, the blades are freakishly sharp, so it slices easily. But most mandolines do that, right? This one, though, does it ... elegantly. 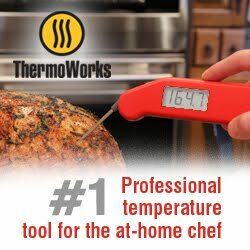 There's just one knob that you turn to set the slicing thickness. If you keep turning, the teeth pop up to cut the julienne or fry slices. Easy peasy. There's just one blade that slides in and out - easily - to switch sides from straight to wavy. Because of all that, there are no sharp loose pieces that you need to store. Nothing that snaps into the bottom or that needs to go into a storage case. It's all just part of the mandoline. Well, there's the hand guard (which works really well, by the way) that isn't part of the actual mechanism. But there are two hooks on the bottom of the mandoline that grab the edge of the guard, and then the fold-down legs hold it neatly in place. So, yeah, this mandoline is definitely an improvement over previous models I've owned. 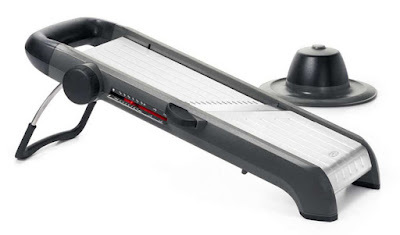 Which is probably why it's named the Chef's Mandoline Slicer 2.0 .
Who's it for: People who slice. Pros: Works well; stores neatly. Cons: SHARP! (If you refuse to use a guard, I suggest a cut-resistant glove ). Wishes: An even larger fry cut would be nice, but I have a feeling it would be too difficult to slice. Source: I received this from the manufacturer at no cost to me.